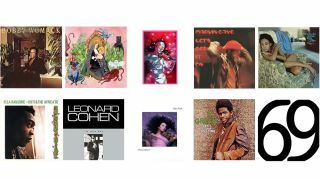 10 of the best vinyl albums to tell someone you love them | What Hi-Fi? Telling somebody you love them can be most daunting. Quickly you come to realise there’s only really one positive response, and you in particular are unlikely to hear it. Because, let’s face it, you’re no poet. You’ll probably mess the whole thing up and push them away, and then you’ll be alone like you always knew you would be. But there is music, the great communicator, conveying the grandest messages, often in the simplest terms. Sharing music is an exhibition of love in itself, a display of thought and understanding of the recipient, and channeling the verses of this planet’s finest lyricists can help us convey those emotions more readily. Here, we’ve made it so you don’t even have to go to the effort of finding that somebody else to express your affections on your behalf, by selecting ten albums with loving titles readily available to buy on vinyl. All you’re left to do is figure out whether in that case you ever really loved them at all. Few better than The Poet to begin our list. Let your significant other know nothing else matters but going home to them, then allow Womack’s velvet vocal guide the evening upstairs. There is absolutely no scenario in which this could go wrong. Best enjoyed by candlelight, Terry Callier’s tender masterpiece embraces folk, jazz, soul and R&B for a seven-song suite that is the musical embodiment of gazing into a lover’s eyes. The ubiquity of Let’s Stay Together on wedding playlists has made it no less affecting, rather it is testament to it being one of the finest love songs ever written. There is anguish later on the record in the form of So You’re Leaving and How Can You Mend A Broken Heart, while La-La For You is a haunting prophecy of the Teletubbies’ arrival 25 years later, but the album rarely strays from the smoothness of its title track. Joshua Tillman’s sardonic wit proves love needn’t be entirely humourless, nor without blemishes or wine stains on the carpet. Lyrically, Honeybear can be wonderfully juxtaposed – see “I want to take you in the kitchen/Lift up your wedding dress someone was probably murdered in”, and “You’re something else I can’t explain/Will you take my last name?” – but the result is romanticism almost in spite of itself. Of all the aforementioned responses to your proclamations of adoration, “love isn’t real” ranks highly among the most galling. Thankfully, John Maus dispelled such myths with the title of this 2007 album, a vintage-synth led record with its sonic roots in 1980s post-punk and goth-pop. The best way to tell someone you love them is by spending lots of money, which makes this six-disc box set absolutely ideal. The album fulfills its promise, with a collection of 69 love songs that spawned some of The Magnetic Fields’ most popular tracks, including The Book Of Love, I Don’t Want To Get Over You and All My Little Words. We’ve all been haunted by the Hounds of Love; Kate Bush’s self-professed cowardice is no flaw. You can use this, one of the great British albums, to let your partner know you’re willing to be devoured. Marvin Gaye had to make it to our list, and there are a handful of other records we could’ve chosen: I Want You, Midnight Love, How Sweet It Is To Be Loved By You. But, if not for the fact this is one of the sexiest soul albums ever recorded, “If you believe in love/Let’s get it on” is one of the finest and most romantic Sophie’s choices one can lay. If your partner isn’t yet swayed by Gaye’s persuasive powers – hey, some people have higher standards than they merit – then perhaps Fela Kuti can interest you in an aphrodisiac, or rather Afrodisiac. This four track record is bound to have you moving; where and how is up to you. Never before or since has someone sounded so cool while submitting to every one of their partner’s whims. But this is Leonard Cohen, and whatever you’ve ever wanted to say, he’s already said it better, and probably still would.